Hello friends! Happy Weekend! This week I’ve been playing the Waiting Game and have passed the time doing things I love like training, baking and volunteering. All’s well that ends well, and I ended the week with a clean bill of health and a 12 month reprieve. I’ve certainly had a lot to be thankful for this Thanksgiving, and my mum as always, is right, your health really is your wealth. Time to breathe and fill our tank with some happy! Let’s hop on down the Rabbit Hole, shall we? First up, Bubbles Bunny here has just given birth to two baby kittens, Hashbrown and Freckles! I didn’t know baby bunnies were called kittens, did you? No wonder, she’s looking like she’s flat out in this picture! Be sure to check out all of Bubbles’ babies on Instagram – cuteness overload. Today is National French Toast Day! I can’t think of a sweeter way to get the day started but, really! Making French Toast in the morning? Ain’t nobunny got time for that! (And when I say nobunny, I mean this bunny!) That’s why Overnight French Toast is the best thing ever. Do the prep the night before so the only thing you have to do in the morning is stuff it in the oven and slather it in cream. Sounds good to me. Very good indeed! Despite not going to work, I seem to be going faster trying to keep up with everything. Lisa’s post is a timely reminder (especially as we’re approaching the pointy, Christmassy end of the year) that we need to make time for slower living. Our gift giving is rather restrained these days because we’d rather collect moments not things. I find Christmas is so much about what we’re getting these days, when really we’re missing the point, it’s all about giving. I love these gifts that keep on giving and this, a Random Acts of Kindness Advent Calendar – with not a chocolate in sight, that’s 100% kindness and zero calories! Winning! Talking of Christmas, every year I like to make a gingerbread house that the witch from Hansel and Gretel would be proud of -with ALL the candy. This Palm Springs version is like the Grand Designs of gingerbread houses! I mean, have you ever?! We are so putting up our tree this weekend and I cannot wait. Our tree has travelled the world with us and I’m emotionally attached to it, but how good is this DIY Christmas Tree? Simply fabulous! As it is the season to be jolly, why not throw kindness around like Christmas glitter? Here are 5 Ways to Be a Good Human, all year long! Professionally, I stick my finger in a lot of pies… teaching, Jamberrying and wannabe counselling. Perhaps I should just ditch them all and work in advertising, if for no other reason than I can take my dog (as in the dog that I haven’t got… yet) to work! Having your dog at your desk – the best! This list of things that make you feel just as awesome as taking your bra off gave me a little giggle. Reading that list made me appreciate that it really is the little things! As much as taking my bra feels awesome, I think watching a Kid President video makes me feel awesome PLUS! He makes my heart happy dance every single time! I have been through every single one of these hilarious 30 stages of realising Kid President is my life coach – that kid, he’s the real deal! Today life coach, tomorrow President for realz! A girl can dream, can’t she! So tell me, are you a fan of Kid President too? What makes you feel as awesome as taking your bra off? Do you need to go slow too? What secret tricks and cunning plans do you have up your sleeve this weekend? Tell me all the things! 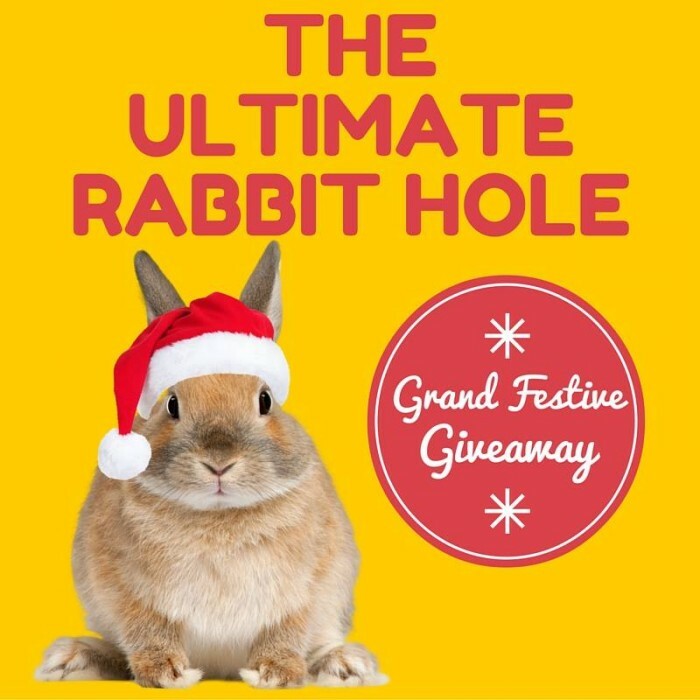 Remember there’s still time to enter our Grand Festive Giveaway and win one of 13 fantabulous prizes. 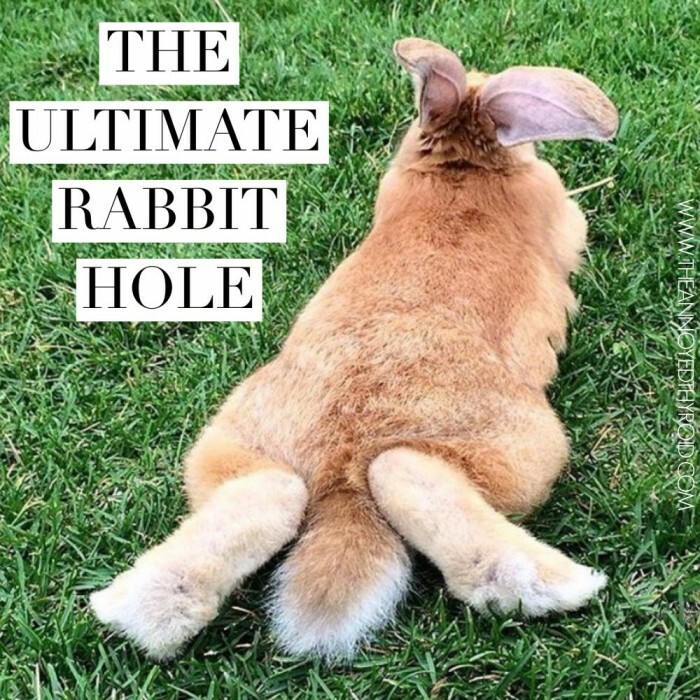 All you have to do is hop on over down to last week’s Rabbit Hole post and leave a comment saying what is your favourite way to spend a weekend and why?